Use our Kickstart invitations to invite past customers to leave a review. It's a great way to get an immediate review boost and requires no technical knowledge. Set up your Trustpilot account so that it automatically sends a review invitation to a customer after they make a purchase. Magento, WooCommerce, Shopify, and BigCommerce users can collect both merchant and product reviews with just a few clicks. 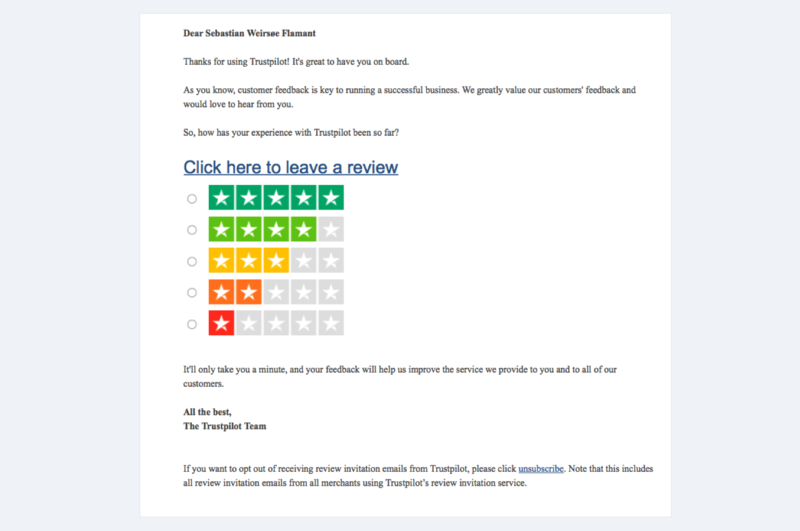 Collect Trustpilot reviews directly on your website. Merge the review invite and response process into your CRM or email client to add the security and customization options of your current system. Use military grade, 256-bit AES encryption to send Trustpilot review invitations without sharing personally identifiable customer information with Trustpilot. Our optimized template ensures maximum review collection, and can be sent from either Trustpilot.com or your own domain. Our invitation email templates can also be customized to stay in line with your style. Don't have time to follow up on review requests? Use automatic review reminder emails - they collect an average of 35% more reviews for businesses. 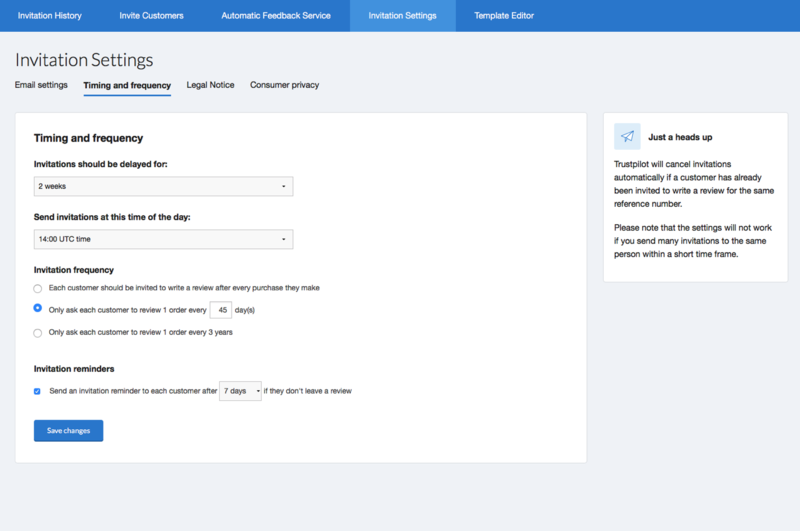 Track your collection rates, source, and change in TrustScore with built in analytics. When people search for your brand, what do they find? 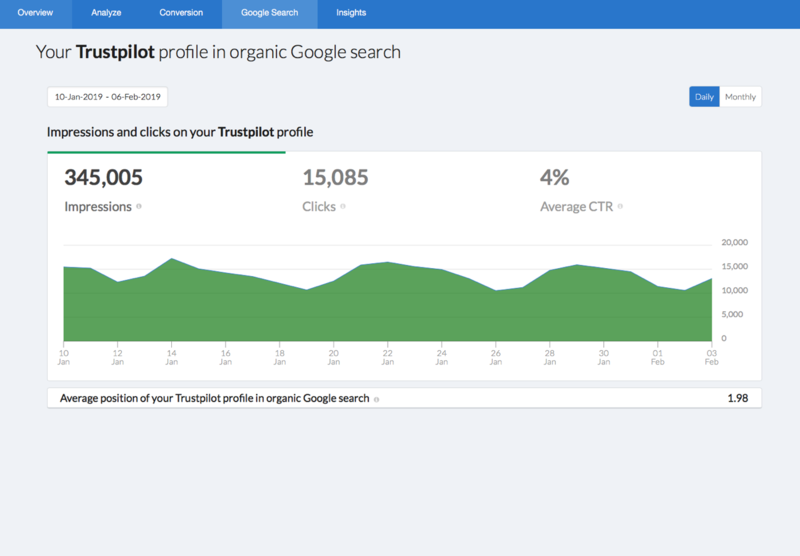 Trustpilot company profiles rank highly and stand out in organic search, highlighting your reputation to potential customers. Clicking on the profile shows all your reviews and responses, links back to your homepage, and builds trust with potential customers. 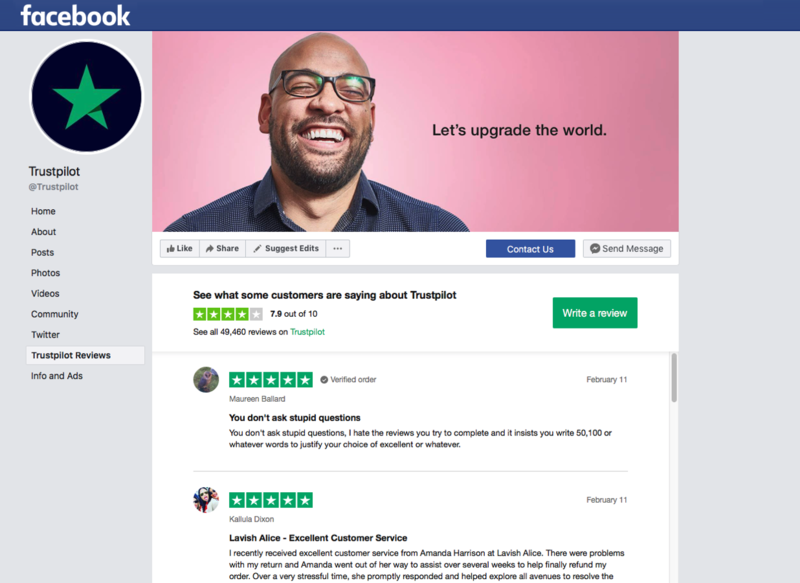 The Trustpilot Facebook app automatically shares reviews on your company’s Facebook page. Share your reviews further with one-click sharing on Facebook and Twitter timelines. 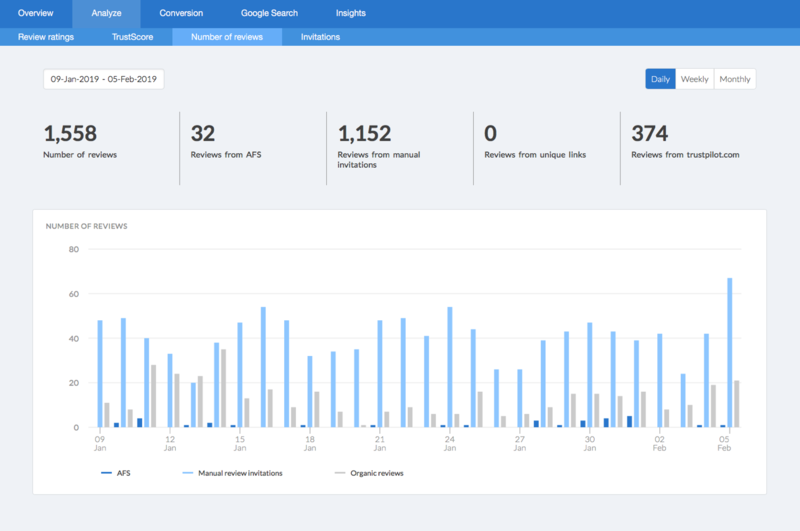 Track where reviews came from, collection rates, and change in TrustScore with our easy to understand dashboard analytics. Drive more traffic at a lower cost: Seller ratings help you earn more qualified leads and improve your ad performance. 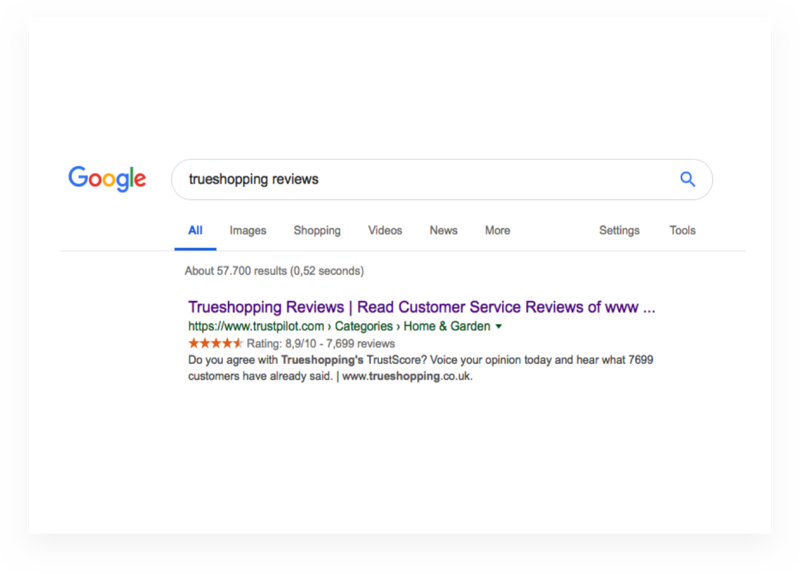 Adding gold stars to your AdWords increases click-through rates which can improve quality score and decrease cost-per-click. 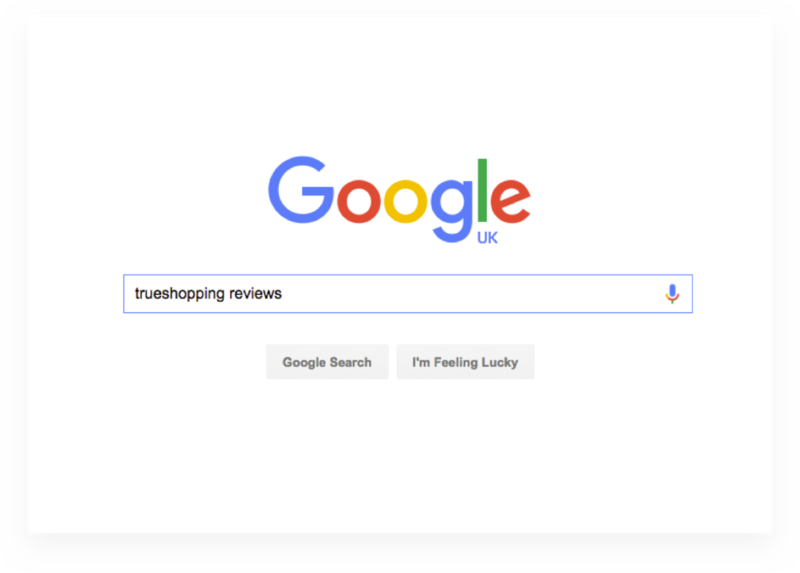 Help shoppers to choose your company at the point of purchase when browsing items through Google Shopping. A TrustBox is the best way to showcase your Trustpilot reviews and rating on your website. They’ve been proven to increase basket size, reduce cart abandonment, and boost conversion rates up to 58%. You can pick from any of our 25 pre-made designs or you can build your own with our Public API. TrustBoxes are displayed by pasting code snippets into your website HTML. Maximize your marketing investment with a built in split testing tool. Learn which TrustBox design and placement on your site performs the best. 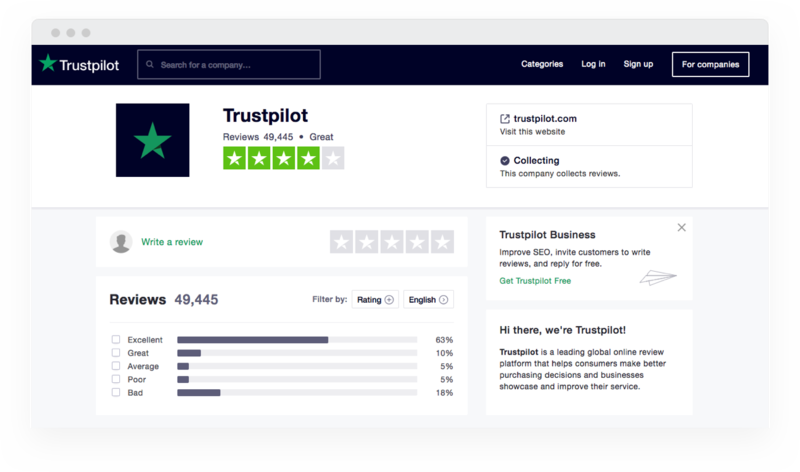 Use the Trustpilot logo, stars and icons to showcase your TrustScore and boost your credibility on billboards, banners, TV adverts, apps, videos and more. Improve your visibility in organic search. Enable Google’s Rich Snippet stars with a simple cut and paste of code. In 5 minutes you can boost your site's visibility in organic search without needing a developer or SEO agency. More searches land on your site with Trustpilot Product Reviews. Customers generate fresh, relevant content for your site, opening your business up to thousands of new keywords to increase traffic. Rich snippet stars increase visibility and CTR in organic search. Product reviews add stars and reviews to your Product Listing Ads so shoppers feel more confident about what they buy from you. Improve customer service and awareness across your whole team by giving multiple people access to your Trustpilot account. 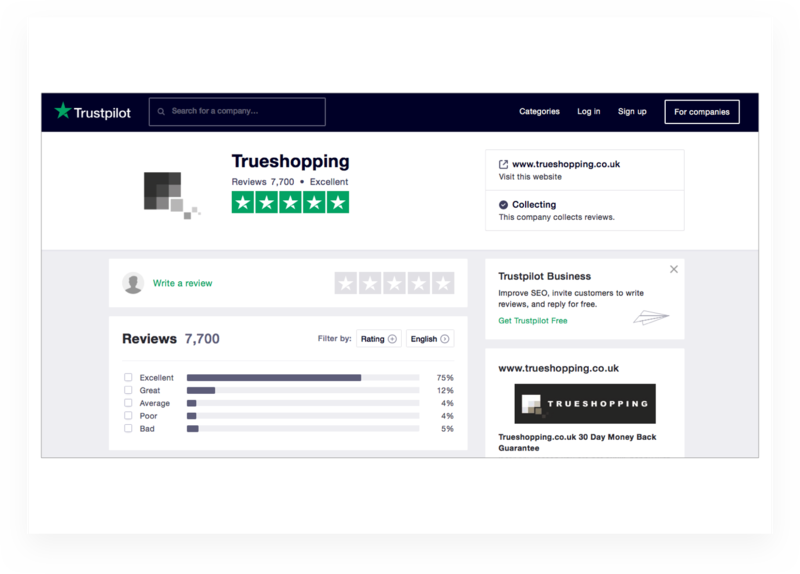 More than 270,000 businesses have reviews on Trustpilot. Get a Trustpilot demo today.